CoreEze is the simple to use solution for concrete drilling. The unique, fully patented CoreEze system moves diamond core drilling of steel reinforced concrete away from the realms of highly skilled operatives with a high investment in plant and equipment. 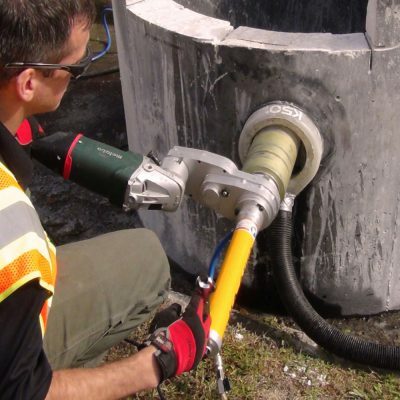 Now previously inexperienced operatives can successfully drill holes in concrete up 250mm diam. CoreEze has been over ten years in development resulting in a user friendly system that is portable, lightweight completely reliable and with a output that never fails to surprise. With the capability to drill cores in what would normally be considered “inaccessible” positions and with the major advantage of retaining the drilled core – the CoreEZe has many features and benefits over conventional drilling systems. If you would like to see a demonstration of this amazing innovation then please have a look in our video section.